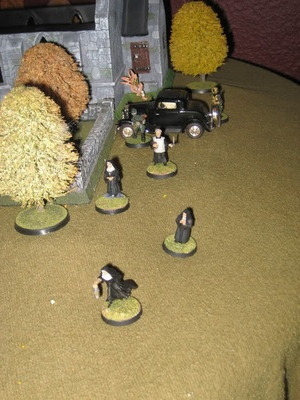 Weird WWII: "The Elder Gods Awaken"
We played a game a while back were a group of cultists had taken over a church that had hidden in it a relic that could be used to control the masses. The local military commander was tipped off by a phone call from a nun from within the church just before the phone went dead. 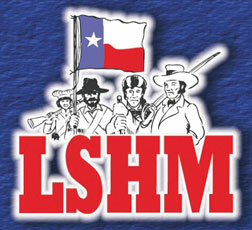 The Major mustered what men he had available and headed off to save the captives and neutralize the threat. Pre-Game Setup. 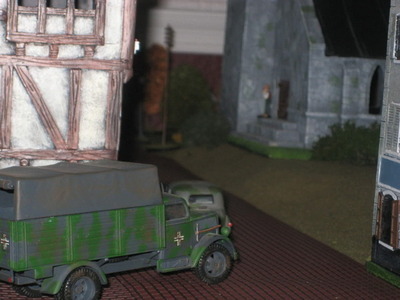 The Germans had a hodgepodge of HQ troops varying from different troop ratings, in a staff car and truck. 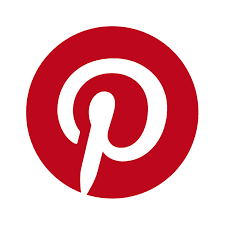 There was a small unknown number of cultists with an unknown number of hostages within the church and maybe elsewhere within the town. 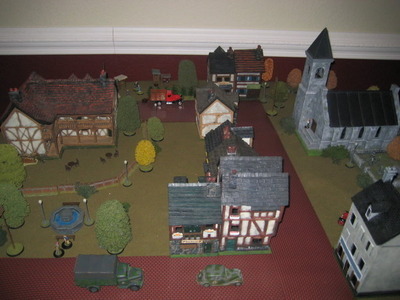 The game is set early in the morning with light civilian activity. 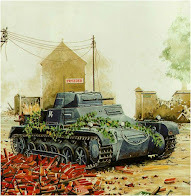 The Germans in route to the church. 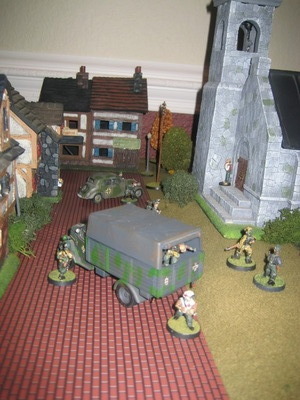 The troops dismount and move to make a perimeter around the church. 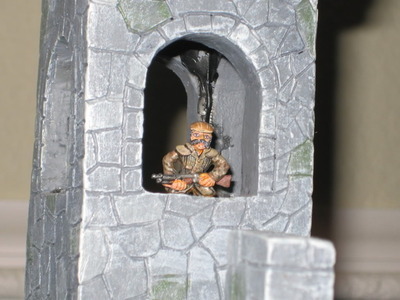 The green Lt moves forward haphazardly and questions the man outside the door. The Lt gets an answer to his inquiry. 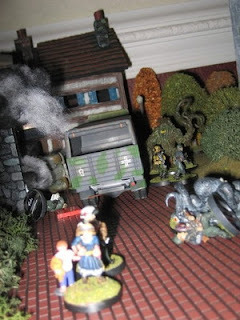 The troops respond with deadly fire! 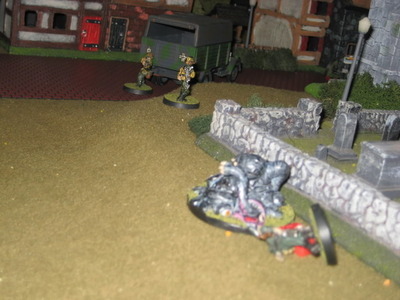 “Medic!” The men rush for the door of the church as the medic sees to the Lt. "Sniper!" 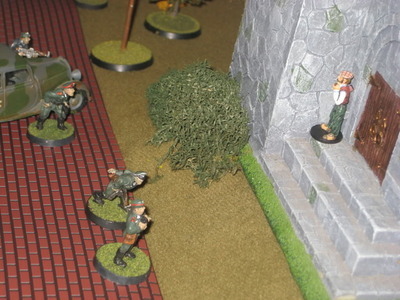 The approaching troops are fired upon by a cultist in the bell tower. 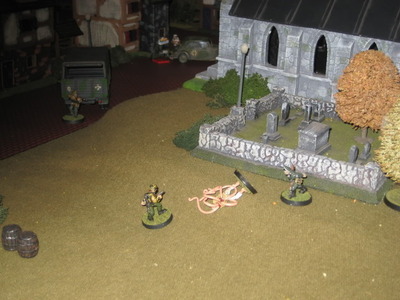 The sniper is taken out with accurate small arms fire and the troops begin to try and knock down the church door. Inside, the cultists herd the clergy to the rear of the church. 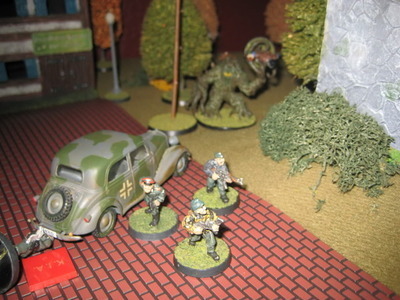 The Germans smash in the door just as one of the cultists begins to evolve. 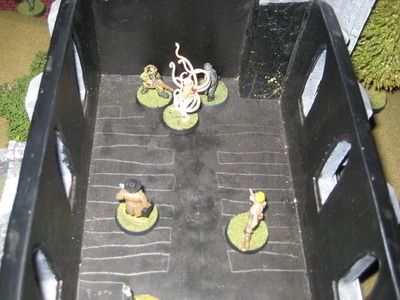 The troops are met with a living monstrosity and begin to fight the cultist and his horrific tentacles. 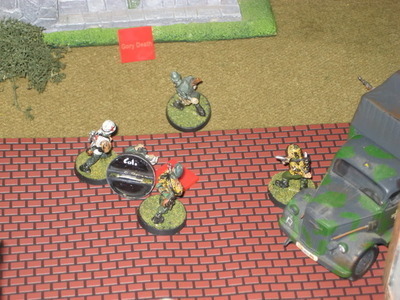 One of the soldiers goes down in close combat with the evolved cultist. 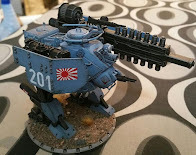 The Sgt. 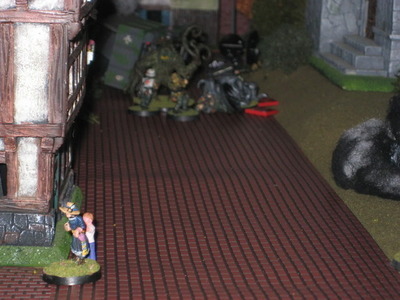 opens up and puts down the monstrosity and another cultist with a deadly spray from his MP40. But just as the men make their way to clear the building, the corpse of the evolved cultist begins to convulse and ooze and then it violently transforms into an even more monstrous creature. 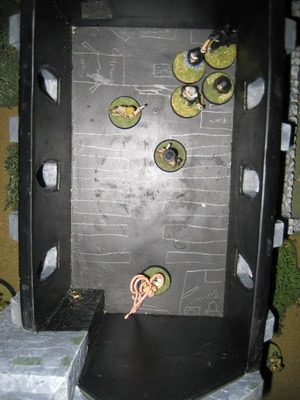 The troops loose their resolve and head back out the front of the church. 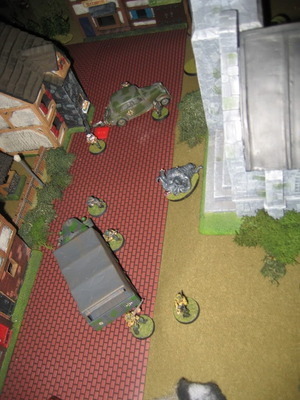 The LT and Sarge head around the back of the church. 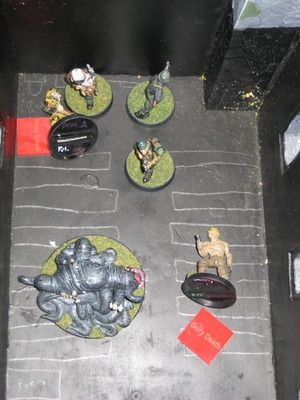 The Lt and Sgt sneak the hostages out the back and give them cover as another cultist begins to convulse and evolve right before their eyes. 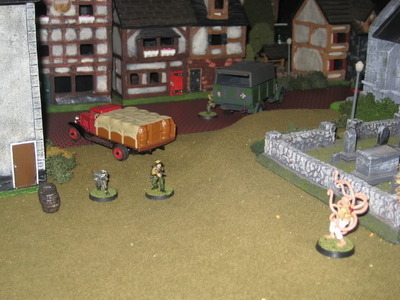 The civilians drive off to safety in the truck as the two soldiers give covering fire. 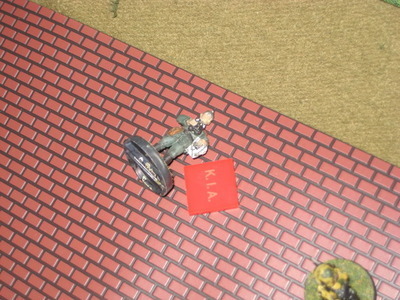 The freak is taken down by the two soldiers. 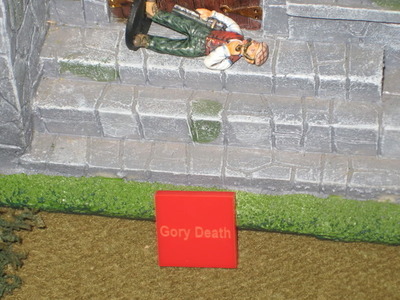 Slowly, the Lt approaches to see what manner of madness they had just dispatched. 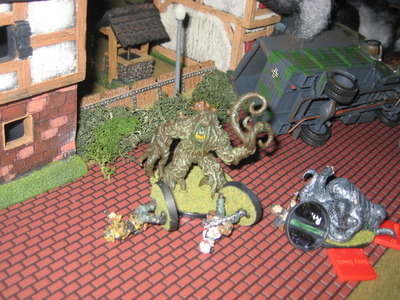 The Lt is grasped by huge powerful tentacles and is ripped apart by the monster. 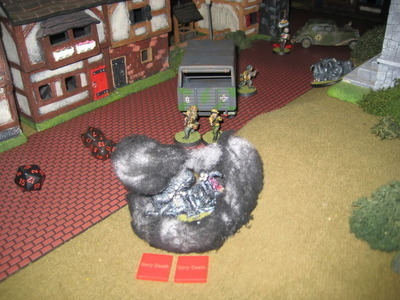 With covering fire, the Sarge throws two grenades into the open maw of the Hellbeast and it explodes into gore. 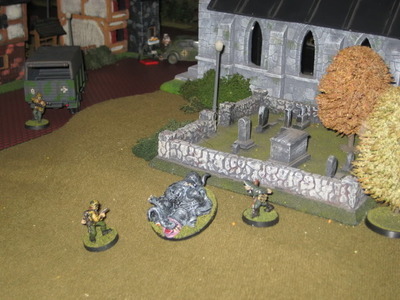 The second Hellbeast appears from the front of the church and is blown apart by concentrated small arms fire by the rallied troops. 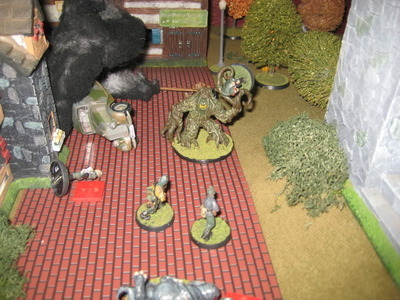 As the troops gaze at the scene before them, out of the woods comes another beast with what looks to be a dismember corpse within it tentacles. 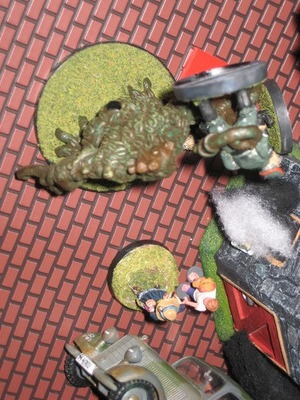 The monstrosity lunges for the CO just as her pulls he fires his pistol in defense. The beast rips the Major in two and throws the staff car into a building, catching it on fire. A terrified mother and her child escape the burning building only to face something more horrifying. 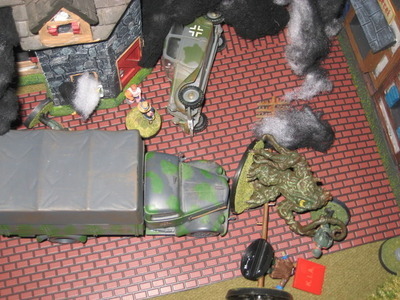 The Sgt leaps into the truck and floors it directly into the monster to rescue the woman and child from a gruesome demise. The men dismount and engage the beast in hand to hand to give the woman and child a chance to get away. 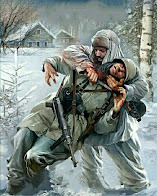 “Run!” The mother and her child make it to safety at the cost of the remaining troops lives. 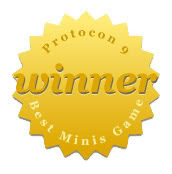 The Elder Gods are triumphant! 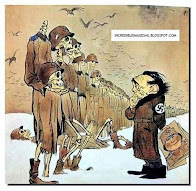 Soon the sleepers will awaken and retake all that was once theirs.